Creating a cozy room in a large space can be a design challenge. Many clients with large rooms want to create a warm and cozy feeling in their home, but are unsure how to do so with so much space! I recently worked with clients to create a cozy family room in their large, two-story family room. The Readings were building a new house and hired me to design their family room — the room that would be used as the main gathering space for parties, holiday gatherings, conversations and art appreciation. The challenges were to create a warm and cozy feeling in a LARGE space and to create a room that functioned well for both large and small groups. Let’s take a look at how I did that! Here’s how I created a cozy, large room. Lowered the ceiling. No, we didn’t literally lower the ceiling, but by hanging a very large chandelier about 8 feet above the floor, I was able to visually “lower” the ceiling. This helps the light feel like it’s a part of the room instead a large orb hanging way above your head! As usual, we put this light ton a dimmer which is key to creating a cozy mood in the room. Brought the furniture off the walls. If I pushed all of the furniture against the walls the room would have a large empty space in the middle with a very nice area rug on it. Instead, I pulled everything in off the walls to make it close and cozy. The large, custom area rug in the middle of the room anchors it all. This creates great, cozy conversation areas, which is so much better than yelling across the room! Size matters. The furnishings are large and scaled appropriately for the room. Smaller sofas would be lost in this space and by filling the space with appropriate seating it feels more cozy. The large, 48″ custom ottoman in the center of the sofas helps fill the space and provides a lot of function to this room at the same time! (Before we ordered the wooden tray for the ottoman this was the Reading’s dog’s favorite spot in the room). Created two seating areas. The two sofas create one seating area and the chaise and wingback chair create the second area. The diamond fabric on the wingback chair is one of my favorites in the room. During the design process this fabric stock ran too low to cover the entire chair so I had to think fast and come up with a creative solution that included that fabric on the front of the chair and a great navy blue fabric on the back of the chair! Both seating areas are close enough together to act as one large grouping, but can also function as two separate areas. These placements really enhance the cozy feeling of this room. Mixed many fabrics. By mixing many fabrics and patterns (there are 8 fabrics in this room — can you find them all?) I was able to create a collected and cozy feeling. They are all in the same color palette and compliment each other (any of the pillows could move to any seat and look great), but they don’t “match.” Together they create a cozy feeling. Included art & warm wood. The clients have an extensive Inuit art collection consisting of stone sculptures. These were always to be displayed in some sort of bookcase as part of this room’s design. I designed a custom built-in, crafted and installed by Summerhill Cabinets, made with warm cherry wood. The cabinet was custom designed to fit specific art pieces and includes museum-quality lighting (with help from the Smithsonian lighting experts and a hidden panel to control the lights) to properly light each piece. 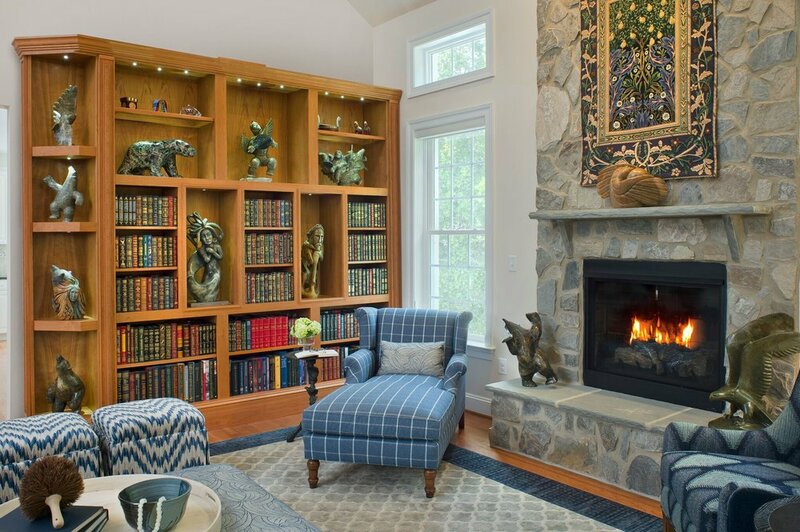 The clients custom-bound books add a lot of additional warmth to this built-in. Between the warm wood, lighting, stone statues and colorful books, we’ve created a wall of cozy! Every design project is a puzzle. Some come together faster than others – but there are often creative solutions to every design puzzle. I enjoyed the challenges this one presented and the clients and I (and their two dogs) are thrilled with the end results.